1. Clip it on the camera. 3. Release the shutter button . The flash fires and its light is automatically controlled by the camera + flash TTL dedicated system. Many photographers think of using a flash only at night or in poor lighting. However, a flash can be very useful in daylight too. Eliminate the shade under trees. Use fill-in lighting to sharpen the subject. Address catchlight in the eyes, and stop motion. Emphasize the lighting contrast. Enjoy more opportunities to use your flash. Tired of your flash no longer working whenever a new camera comes onto the market ? A firmware upgrade service is available for the Di622 , which provides a service terminal to upload the latest software. A charge for the firmware update service will apply, varying depending on the area. Please check at your local dealer for details about the update service. The flash beam covers the frame from 14mm (with a wide angle diffuser built-in) to 70mm of the digital lens. (*) For a longer lens, the flash head reflector position stays at 70mm. It turns 90 degrees upward and 270 degrees horizontally for bounce lighting. The flash head also stores a small reflection panel for fill-in shots. (*) The focal length for the traditional SLR camera is to be multiplied b a factor of 1.5. 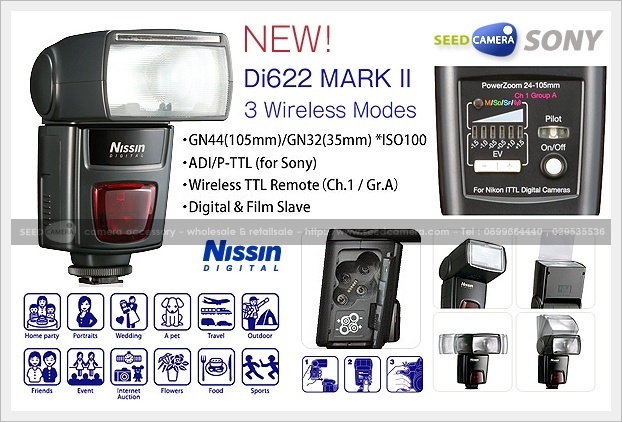 Di622 Mark II has a wireless remote flash system as a slave unit. Slave Digital (SD) : Di622 Mark II synchronizes to the pre-flash system. The master flash is to be set at TTL (E-TTL for Canon and i-TTL for Nikon) mode. Slave Film (SF) : Di622 Mark II synchronizes to the traditional single flash system. The master flash is to be set at manual mode. Studio lighting system synchronizes to this mode. This mode is also available for open flash, and for a standard flash in the market. Wireless TTL : Di622 Mark II synchronizes to the wireless remote flash system. The master flash is to be set at Channel 1 group A in wireless remote mode. The flash power level can be adjusted from -1.5EV through +1.5EV by 0.5EV steps. at the desired exposure level, in +/- 0.75 Ev. by 0.25 Ev increments. Di622 Mark II can be used without hotshoe cameras. Some cameras provide a flash synchronization contact at X-terminal instead of hotshoe. For this type of cameras, Di622 Mark II has a X-terminal socket for flash synchronization. The Di622 MARK II has a dual energy saving system. With the flash unit set for slave mode, sleep mode is cancelled and the unit will not automatically turn off until 60 minutes have elapsed. The power level is provided from full power (G.No.62) down to 1/32nd power in 1.0Ev increments. In darkness or dim light conditions, the Di622 MARK II beams a red light to create a sharp contrast to enable the camera's focus sensor to focus easily on the subject. The Di622 MARK II is compatible with either the FE lock (Canon) or FV lock (Nikon) system. Nikon and some Canon camerra's set the flash for rear curtain synch. photography. The Di622 MARK II follows the command signal of theses cameras. - Recycling time : 5 sec., with fresh alkaline batteries. - AF Assist light : Infrared LED for distance of 0.7 to 6 meter. - Flash duration : 1/800sec. to 1/20,000sec.